I like these jeans as they are cotton, but since they have been stone washed or at least treated to soften them they don't wear well in the upper areas, pockets,where they meet the double areas for example. I've only had these for about a year and have just about worn out the uppers. At over 45.00 I expect better. I shouldn't be able to wear these out since I am nearly 70. I’ve been wearing this style of jeans for 15 years, and I recommend them to anyone who works hard. Comfort and rugged! Please bring back the B07 and discontinue these instead! I was hoping since you discontinued the B07 that these would be a sufficient replacement, however I was extremely disappointed in every aspect of these jeans! I’ve been wearing nothing but the B07 for the past 15 years and these don’t fit right! There not as durable as the B07 or as comfortable. I would have wore carhartts until the day I died. I dread the day I wear out my last pair of B07’s because honestly I don’t know what ill wear. For 30 years I have been wearing these jeans. They are the only work pants that can keep up with the torture I put them through. I see people wearing Carhartt as a fashion statement. I wear them because they are the only jeans that can keep up with me and the work of being a professional carpenter. DO NOT CHANGE A THING!!!!! 5 stars are too few for these logger jeans. I have worn this style of Carhart double kneed jeans for years. 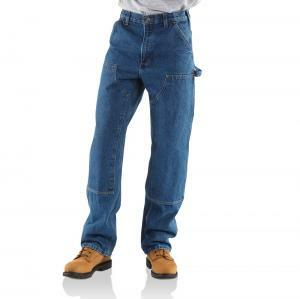 I have been a millwright and a plumber and these are the best jeans I have ever had. I am down on his knees a lot and really likes the double knee layer. They are very durable. I hope i will continue to be able to get this style in the future.